For breakfast this morning I made a new version of a previous recipe but used squash instead of sweet potato. 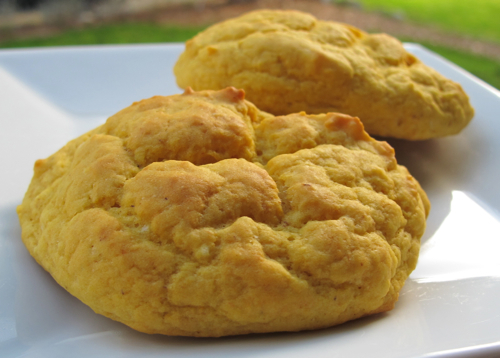 The biscuits stay pretty flat but have a nice mild flavor. I served the biscuits over a modified version of my vegan friendly mushroom gravy. Preheat the oven to 400° and line a baking sheet with parchment paper. Whisk the wet ingredients together in a large mixing bowl. Sift the dry ingredients into a small bowl. Stir the dry into the wet, until a dough develops. Divide into 12 drop biscuits on the baking sheet, bake for 15 to 25 minutes, or until done (they will be a moist/heavier biscuit). When done they will be golden on top. Previous Post Double Peanut Butter Cupcakes – Only For Those Who LOVE PB!